Besides storage system companies, there were many folks with storage software and component technology on display. Let’s look at some of these as well as NVIDIA activities on ADAS and autonomous vehicle testing and finish with an interesting autonomous vehicle on display at the show. 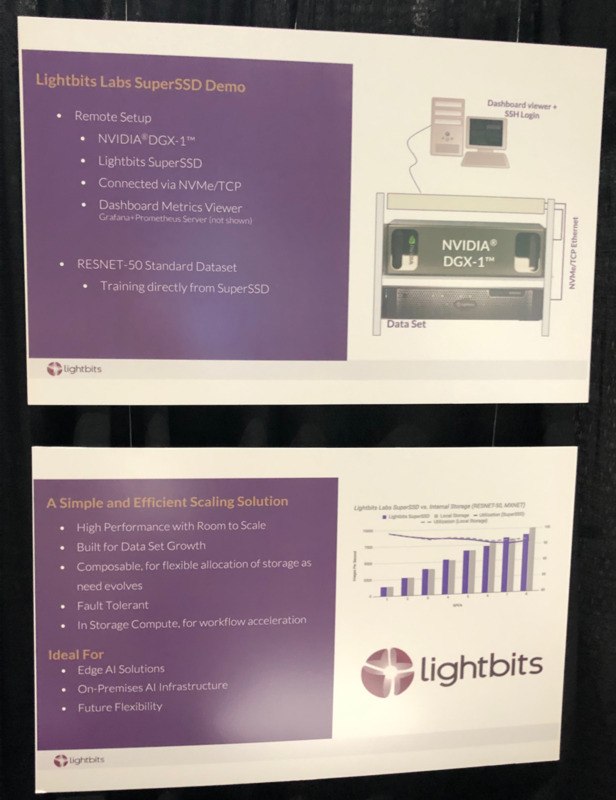 Storage startup, Lightbits, was s showcasing its LightOS with the DGX-1 GPU AI platform. Lightbits says that its technology allows scaling up a DGX cluster while Lightbits takes care of the high-performance, low latency storage. 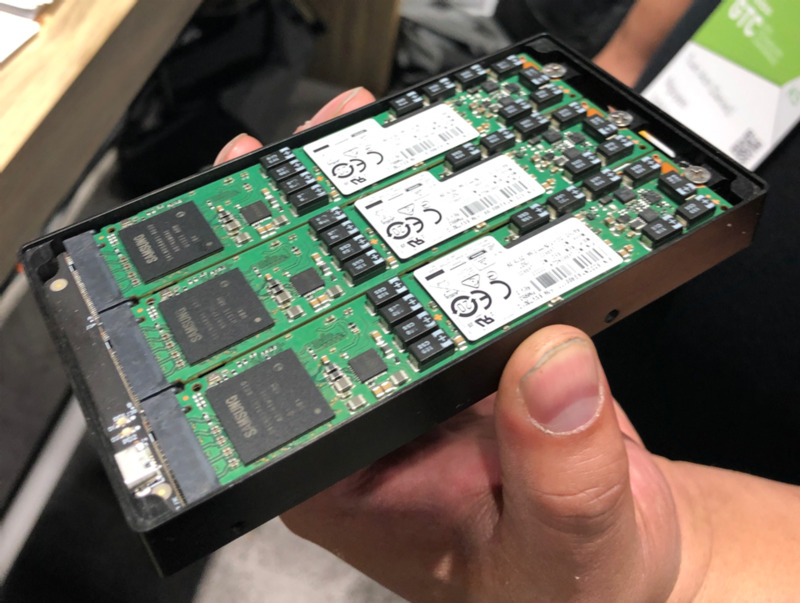 Their demonstration showed a DGX-1 utilizing NVMe/TCP connected storage to keep all eight GPUs in the DGX fully utilized. On the DGX was a workload driven by TensorFlow Machine Learning software executing a RESNET-50 Neural Network AI training program. The image below was from the Lightbits exhibit. 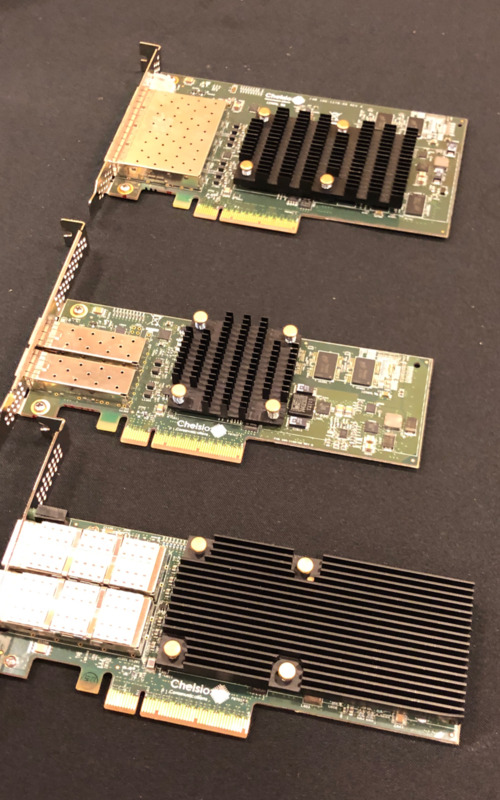 Chelsio Communications was showing their PCIe united wire adapters for data, storage and high performance clustering applications. These products can be used to put together an NVMe over fabric network. Liqid has pioneered in composable infrastructure using “bare-metal” machines connected with their low latency PCIe switches. These can be used to create interconnected pools of disaggregated system elements, such as storage devices. These pools can then be managed by software on a web-based interface to create customized abstracted collections of resources to perform a given talk. This composable infrastructure makes data center resources as readily available as cloud services, and is the foundation for private and hybrid cloud solutions. The image below shows a Kingston/Liqid 2.5-inch PCIe SSD. Samsung was showing memory and storage solutions for AI/ML applications. Their exhibit included a 300mm 7nm EUV processed wafer as well as DDR4 memory and high bandwidth memory (HBM). 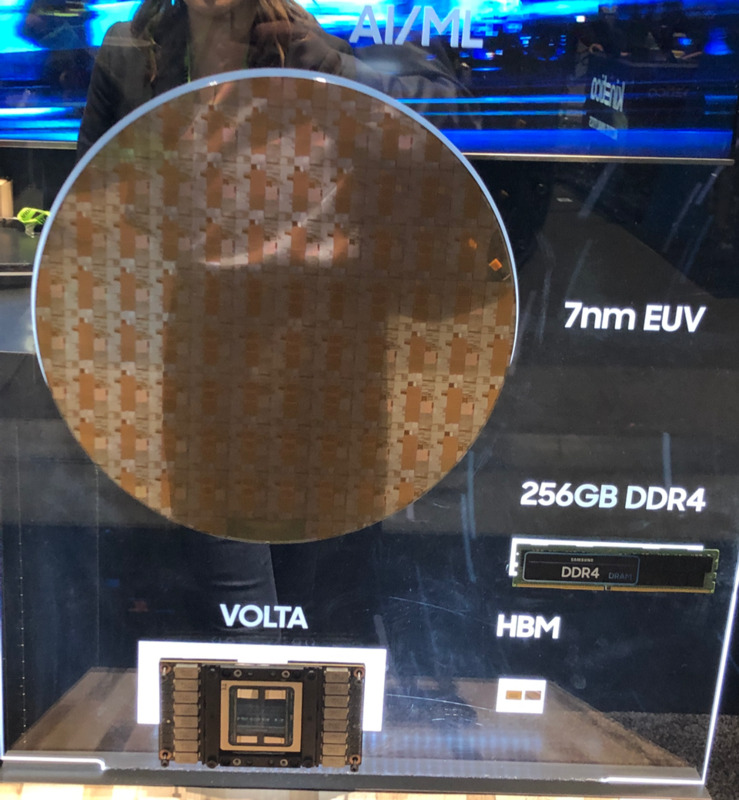 Note that the Samsung foundry is reportedly building NVIDIA 7 nm Volta product. 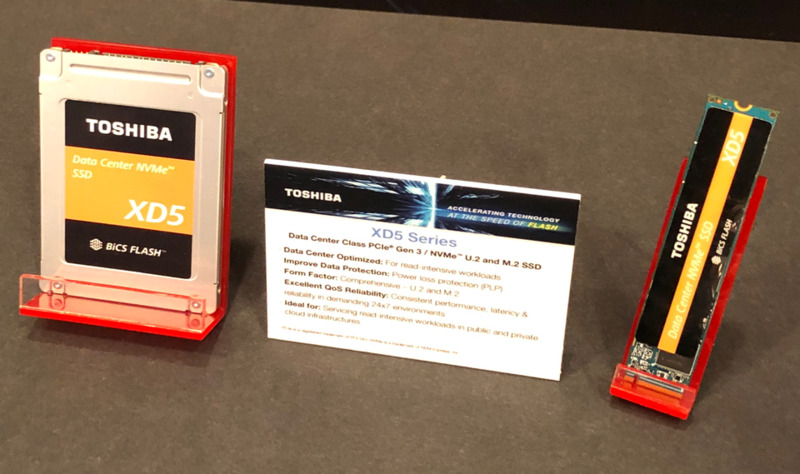 Toshiba had several SSD products on display. The picture below shows a U.2 and a M.2 PCIe NVMe drive. 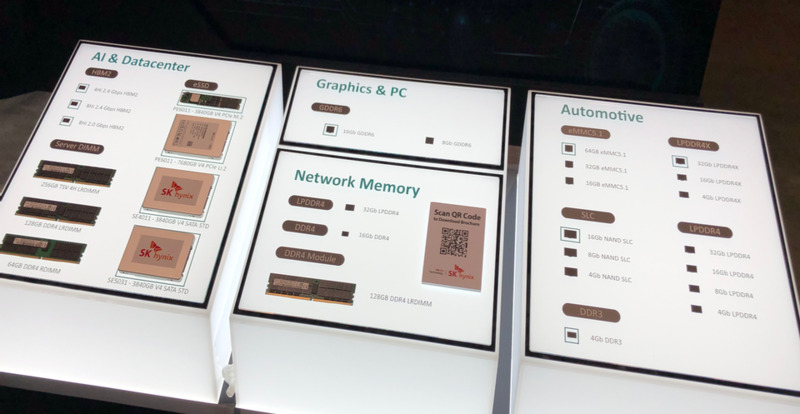 SK Hynix was showing their line of DRAM and Flash memory products in the GTC exhibit area, spacing automotive, network memory, graphic and PC memory as well as AI and data center applications. Among the most interesting AI applications NVIDIA was showcasing in their keynote was an open platform virtual test fleet for bit-accurate hardware-in-the-loop simulations. This Driver Constellation GPU computing solution, suitable for cloud-based simulations, allows running multiple simultaneous autonomous driving simulations, including edge cases and rare conditions and simulating previous failure conditions. Driver Constellation was one of several hardware and software products geared to advance autonomous vehicle and driver assistance capabilities. They also demonstrated what they call a Safety Force Field for path perception, planning and prediction and enabling advanced safety reaction features. Below is an image of an autonomous truck made by TuSimple from Germany, in the GPC exhibit area. Storage components and the software to manage them make modern machine learning applications possible. 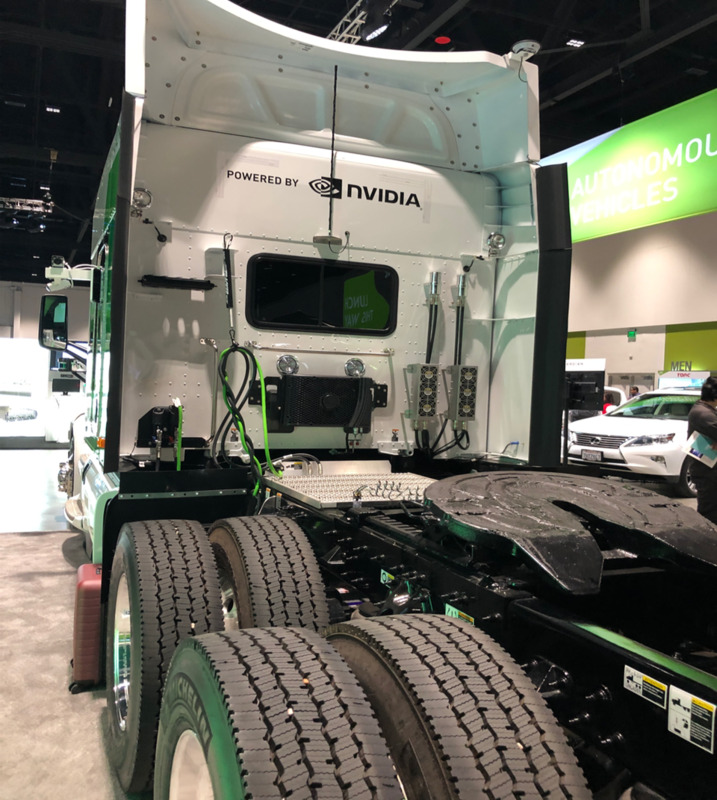 The 2019 GTC show included products enabling fast NVMe over fabrics, composable infrastructure and storage that enables applications such as autonomous long haul trucks. Company Culture Can Make Or Break A Company. Let’s Call On The Experts.